Shaken baby syndrome is a severe form of child abuse caused by violently shaking an infant or child. 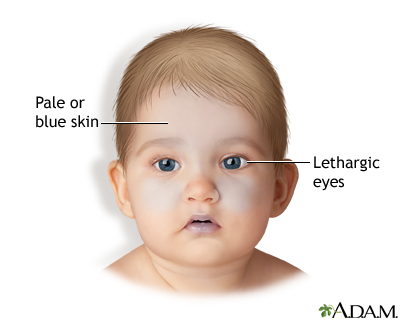 Shaken baby syndrome can occur from as little as 5 seconds of shaking. Shaken baby injuries most often occur in children younger than 2 years old, but may be seen in children up to 5 years old. When an infant or toddler is shaken, the brain bounces back and forth against the skull. This can cause bruising of the brain (cerebral contusion), swelling, pressure, and bleeding in the brain. The large veins along the outside of the brain may tear, leading to further bleeding, swelling, and increased pressure. This can easily cause permanent brain damage or death. Shaking an infant or small child may cause other injuries, such as damage to the neck, spine, and eyes. In most cases, an angry parent or caregiver shakes the baby to punish or quiet the child. Such shaking most often takes place when the infant is crying inconsolably and the frustrated caregiver loses control. Many times the caregiver did not intend to harm the baby. Still, it is a form of child abuse. Injuries are most likely to happen when the baby is shaken and then the baby's head hits something. Even hitting a soft object, such as a mattress or pillow, may be enough to injure newborns and small infants. Children's brains are softer, their neck muscles and ligaments are weak, and their heads are large and heavy in proportion to their bodies. The result is a type of whiplash, similar to what occurs in some auto accidents. Shaken baby syndrome does not result from gentle bouncing, playful swinging or tossing the child in the air, or jogging with the child. It also is very unlikely to occur from accidents such as falling off chairs or down stairs, or accidentally being dropped from a caregiver's arms. Short falls may cause other types of head injuries, although these are often minor. There may not be any physical signs of injury, such as bruising, bleeding, or swelling. In some cases, the condition can be difficult to diagnose and may not be found during an office visit. However, rib fractures are common and can be seen on x-rays. An eye doctor may find bleeding behind the baby's eye or retinal detachment. There are, however, other causes of bleeding behind the eye and they should be ruled out before diagnosing shaken baby syndrome. Other factors must be considered. Call 911 or your local emergency number. Immediate emergency treatment is necessary. If the child stops breathing before emergency help arrives, begin CPR. And you do not think there is a spinal injury, turn the child's head to one side to prevent the baby from choking and breathing in vomit to the lungs (aspiration). And you do think there is a spinal injury, carefully roll the child's whole body to one side at the same time (as if rolling a log) while protecting the neck to prevent choking and aspiration. Do not pick up or shake the child to wake him or her up. Do not attempt to give the child anything by mouth. Call your health care provider if a child has any of the above signs or symptoms, regardless of how mild or severe they are. Also call if you think a child has shaken baby syndrome. If you think a child is in immediate danger because of neglect, you should call 911. If you suspect that a child is being abused, report it right away. Most states have a child abuse hotline. You may also use the Childhelp National Child Abuse Hotline at 1-800-4-A-Child (1-800-422-4453). Never shake a baby or child in play or in anger. Even gentle shaking can become violent shaking when you are angry. Do not hold your baby during an argument. If you find yourself becoming annoyed or angry with your baby, put the baby in their crib and leave the room. Try to calm down. Call someone for support. Call a friend or relative to come and stay with the child if you feel out of control. Contact a local crisis hotline or child abuse hotline for help and guidance. Seek the help of a counselor and attend parenting classes. Do not ignore the signs if you suspect child abuse in your home or in the home of someone you know. Dubowitz H, Lane WG. Abused and neglected children. In: Kliegman RM, Stanton BF, St. Geme JW, Schor NF, eds. Nelson Textbook of Pediatrics. 20th ed. Philadelphia, PA: Elsevier; 2016:chap 40. Mazur PM, Hernan LJ, Maiyegun S, Wilson H. Child abuse. In: Fuhrman BP, Zimmerman JJ, eds. Pediatric Critical Care. 5th ed. Philadelphia, PA: Elsevier; 2017:chap 122.